Right off the bat it was clear the presentation by Will Billings, vice president and global controller at World Fuel Services, would be different. He brought a copy of Dr. Seuss’ “Oh, the Places You’ll Go!” which he asked the graduate students in Associate Professor Antoinette Smith’s IT Auditing class to sign. His talk, on June 12 at FIU’s Ryder Business Building, was billed as a deep dive into the technology changes rippling through the accounting practice. Yet the College of Business accounting students got far more. Billings did lay out pathways to success, but it was more treasure map than road routes. Hence, the use of the Dr. Seuss book, which shows how life never unfolds in a straight line, but is more of a curlicue: ups and downs, adventure, adversity and surprises, good and bad. “What he actually talks about are the exact things taking place in one’s career,” said Billings, whose employer, World Fuel, is the largest public company in Florida, and No. 91 on the 2018 Fortune 500 list. As a numbers guy, Billings summarized his approach via formula: capabilities + relationships = X, where X stands for success, opportunity, happiness, or almost any of the goals the students are working toward. Billings’ own background illustrates how, by pulling together skills, talents, interests and opportunities, one fashions career tools that can take one any place one wants to go. Born in Chicago, Billings earned his undergraduate degree in accounting at Southern University and Agricultural and Mechanical College in Baton Rouge. He worked as an assurance supervisor at Ernst & Young (EY), vowing to be the best in assurance. He worked in a technical audit role, spending a year in London. “Now I was a worldly technical accountant. I was differentiated.” It was another career building block. Yet happiness eluded him. He thought about his deep childhood interests: constructing things and, as the youngest of four, working harmoniously with others. That insight became his lodestar. “If I could work in teams, collaboratively, and fix problems,” that would lead to the kind of success and happiness he wanted, he said. Before coming to World Fuel in 2015, Billings was global controller at GE, earlier working at BDO Seidman, LLP and McDermott International, Inc. Along the way he earned an MBA from Rice University. He found himself attracting positions that engaged his passion for collaboration. While not a huge fan of social media, Billings wants students to understand the power of LinkedIn for networking. In fact, LinkedIn – and an FIU connection — brought Billings to Smith’s class in the first place. to speak to FIU’s National Association of Black Accountants (NABA) chapter. “I used LinkedIn to see which one of my connections knew someone at World Fuel,” and Mirabal put her in contact with Billings. Meeting Billings was one way to reach beyond the classroom. 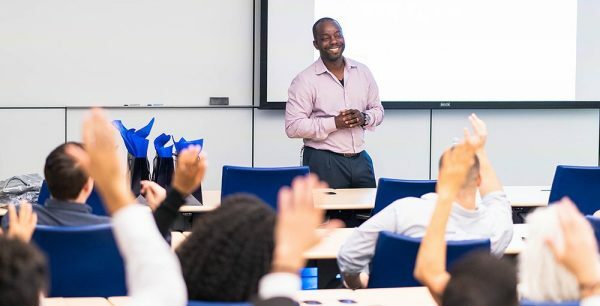 “Sometimes we need people to remind us to dig deep inside and find that motivation.” And students got a rare chance to interact with a Fortune 500 executive, an opportunity that doesn’t arise everyday, Smith added. And interact they did. The class was earlier invited to connect on LinkedIn, and Billings spent time asking each student about their motivation and drives. Meanwhile, Billings and several members from his World Fuel team–Maria Disla, lead, technical accounting operations, who earned a bachelors in psychology in 2005 and masters in Information Management & Technology in 2007, both from Syracuse University, and two FIU alumni, senior accountants Jessica Arbella, (MACC ’14 BACC ’13) and Yovanny Duque (BBA ’10)–used the second part of the presentation to explain how transformational technology is disrupting the accounting profession. In particular, they talked about designing robotic processes at World Fuel to automate recurring journal entries and associated activities. The team – all close in age to the students — shared how they navigate key elements Billings identified as crucial to success, including choosing a mentor, nurturing adaptability, overcoming challenges, collaboration and competition, and resilience. The students said they found the presentation energizing.